Discussions Magazine Music Blog: CHEATAHS: An EXCLUSIVE interview! Somewhere beyond the wall of sleep, there is a sound. At times, it mirrors the dread you feel in your nightmares. Other times, it is the shimmering, ethereal whisper of those moments when you drift in and out of your dreams. Here in the real world, those opposing sounds have been harvested together in a musical genre that is often referred to as Dream Pop. Twenty years ago, a very similar style was all the rage across Europe and on college campuses here in the U.S. However, back then we referred to it as Shoegaze and for a brief moment, it shined. Bands as diverse as The Jesus & Mary Chain, My Bloody Valentine, Ride, Lush and Slowdive were lumped into this new genre that combined the ear-splitting volume of guitar rock, the haunting vibes of Krautrock and the beautiful melodies of classic Pop. Though short-lived, this movement inspired a new generation to pick up their guitars, turn them up and strum away while gazing at their shoes (hence the origins of the genre’s name). When electronics were added to the mix, Dream Pop was born and has slowly evolved over time. Though not directly influenced by either Shoegaze or Dream Pop, the UK based quartet Cheatahs has been embraced by lovers of those two genres. The four members of the band – Canadian guitarist/vocalist Nathan Hewitt, German drummer Marc Raue, San Diego-born bassist Dean Reid and British guitarist James Wignall – create a noise that is always dreamy and beautiful but doesn’t stay in one place for too long. Their 2012 EPs were edgy, American Indie Rock-influenced affairs that managed to maintain an atmosphere closer to the rainy streets of London than the sunbaked pavements in L.A. With each release, they’ve expanded and developed a sound that is far more emotional and powerful than their early releases suggested. With their 2015 album Mythologies, they’ve created a record that may become the link between yesterday and tomorrow. The first half of the album is classic Cheatahs with a little shimmer added. However, the second half of the album takes their sound and sends it into space. The music floats through the air, pulsates through your ear canals and caresses your skin. The songs are sonically linked to another world yet still have roots here on earth. 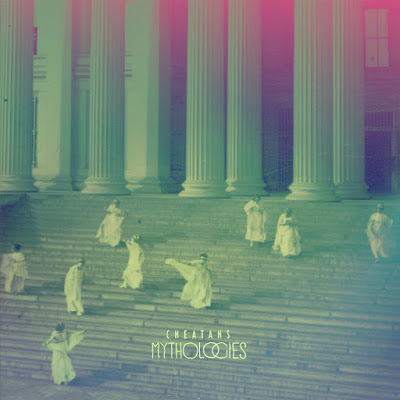 If you are pleased by recent tours and albums by reunited acts like Ride, Lush, My Bloody Valentine and Swervedriver, then you really should do yourself a favor and check out your new favorite band, Cheatahs. STEPHEN SPAZ SCHNEE: Your album Mythologies is about to be released. How are you feeling about the album and the reaction to it so far? MARC RAUE: The reaction’s been really good. We’re very excited to get out and play it for people. I can’t wait! SPAZ: The songs on the album are shimmering slices of lovely melodies mixed with ethereal mayhem. What is the songwriting process like? Do they have to work on an intimate, acoustic level before you take them to the next stage? MARC: The songwriting process this time around was quite different to the previous records. On the other records, we’d grab the acoustic guitar or start with a guitar line and build the song up from that. This time, we’ve made quite a leap in terms of challenging ourselves and using synthesizers, creating sounds and using that as a starting point and moving forward from that. It’s been quite different this time around. SPAZ: The second half of the album seems more experimental and almost Krautrock-like compared to the first half. Was that intentional? MARC: It had more to do with when we were choosing the track order, we imagined it as a vinyl LP and where the songs would be on the record. We wanted one side to be this soundscape where you slide from one song to the next. We wanted to make it like an experience. SPAZ: There’s a thin line between dreamy and droning. How do you manage to maintain a sense of beauty in your work and avoid just making a noise? MARC: (Laughs) I don’t know. I guess it might have to do with having four entities involved – everybody has an opinion and we’re working together as a group. For example, James would come up with a noise line on his guitar and Nathan might add something more beautiful to it. It’s the combination of influences from the different people involved in the band that makes it what it is. SPAZ: The interplay between instruments is very important. MARC: It’s a long process. We’d keep going back to things and approaching them from different angles. That’s how we worked for the record. SPAZ: The band continues to move forward while still maintaining your own identity. Are you pleased with the journey the band has taken musically and that the audience has moved forward with you? MARC. I’m very pleased we’ve moved forward. This new record shows much bigger progress and I’m happy with it. We keep challenging ourselves and evolving. SPAZ: The band features four musicians from four different countries all coming together and forming in the UK. How did that come about? MARC: We all met in London through making music – different bands and different projects and just ended up together eventually. SPAZ: Who were your influences musically? There seems to be a lot going on in the textures of your sound. MARC: We all listen to so much music, it’s quite hard to pin down. On the early records, you can hear My Bloody Valentine and Dinosaur Jr. but I think we’ve moved on from that. Personally speaking, I’m a big fan of Talk Talk’s Laughing Stock record. We listen to a lot of Nico and Velvet Underground. That’s certainly been an influence. There’s so much music out there. Being on tour and playing with different bands is a big inspiration. There are so many different layers that come together and inspire our sound. SPAZ: Cheatahs are often labeled a ‘Shoegaze’ band. But how do you view yourselves? MARC: We’ve never labeled ourselves Shoegaze. I don’t think we ever set out to be that, either. In the media, it needs to be labeled for it to make sense, I suppose. Labeling ourselves is a thing we don’t think about. But…if we were to label ourselves, maybe it would be Ambient Punk. (Laughs) Maybe that’s a good description of the band! 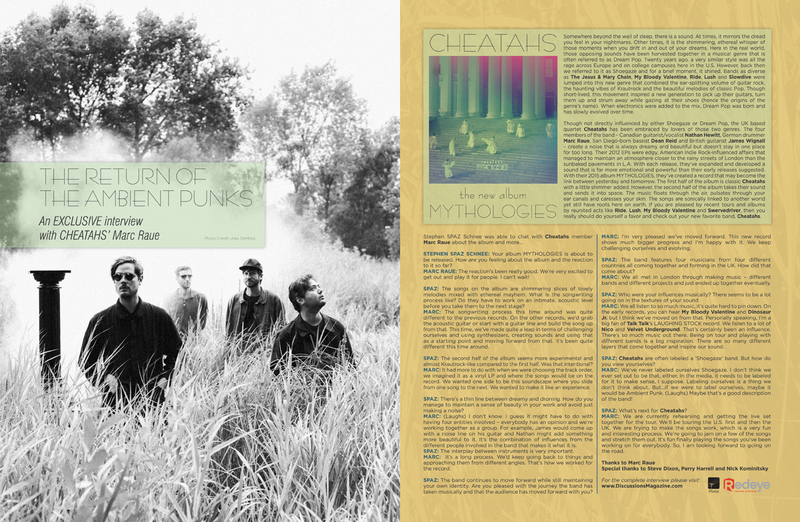 SPAZ: What’s next for Cheatahs? MARC: We are currently rehearsing and getting the live set together for the tour. We’ll be touring the U.S. first and then the UK. We are trying to make the songs work, which is a very fun and interesting process. We’re going to jam on a few of the songs and stretch them out. It’s fun finally playing the songs you’ve been working on for everybody. So, I am looking forward to going on the road.